Are you starting to lose your Spanish vocabulary? Have you enjoyed your constant improvement being at ILISA? Does your schedule not allow you to come back to Costa Rica at the moment? Sign up today for online classes! 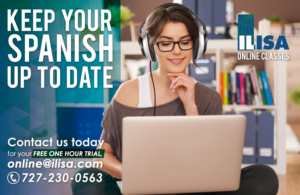 Benefit from a flexible schedule and keep your Spanish up to date until your next immersion program! Please contact us to check the availability of our instructors. ILISA partnered with East Carolina University to offer online conversation classes for honors students at ECU. For this purpose is used a software that allows students to enjoy a Spanish classes while in the US with a Costa Rican native speaker instructor every week. This pioneer program became very successful at ECU and for the summer 2013 one of the students of this online class came to Costa Rica for our summer program and got to know his teacher Karen. Fore more information contact us spanish@ilisa.com or give us a call to our US number 727-230-0563. Cancellations are not accepted unless we receive a 24 hour notice in order to reschedule your class.